I’m sure that today today wasn’t an easy day for you, Olivia, Madeline, Megan or Hilarie. I send each of you my deepest condolences on the loss of your mother. It is, I think, the hardest loss of all – and makes every subsequent Mother’s Day, and all the days leading up to it, difficult, painful, and sad. Nonetheless, your story in today’s New York Times about shopping with your mom for a wedding gown before she died tells me you are realists, and I hope my message will appeal to that aspect of your character. Although I am neither a genetics professional nor a doctor, my own experience has taught me a bit about hereditary breast and ovarian cancer (HBOC) and how it passes from one generation to the next, sometimes far under the radar, only to emerge long enough to rob our mothers, sisters, aunts, or cousins (and, yes, sometimes even our fathers, brothers, cousins, or uncles) of the long, rich full lives they deserve. Mary and Betsy, I am cheering loudly and enthusiastically for your mom, and I hope her new chemotherapy does what it’s supposed to do, but this message is for you (and your mom) as much as it is for the other young women in the Times story. If your mom was never tested for a BRCA mutation, and no doctor has ever suggested that you, your siblings, and your mom’s siblings or their children (your maternal first cousins) get tested, I would urge you to consult with a certified genetic counselor. He or she can assess your family history and your personal risk, discuss the test – which consists of providing nothing more than a saliva or blood sample – and interpret the results, should you decide to have it done. If you do test, I hope, of course, that your results are negative and that you can forget entirely about this letter. If you test positive for a mutation (ptht, ptht, ptht), a genetic counselor can help you devise a plan to manage your increased risk for breast and ovarian cancer, as well as for pancreatic cancer and melanoma. Your male siblings and cousins (if they’re positive) are at increased for breast, prostate, and pancreatic cancer, as well as melanoma, and a genetic counselor can help them, too, manage their risks appropriately. 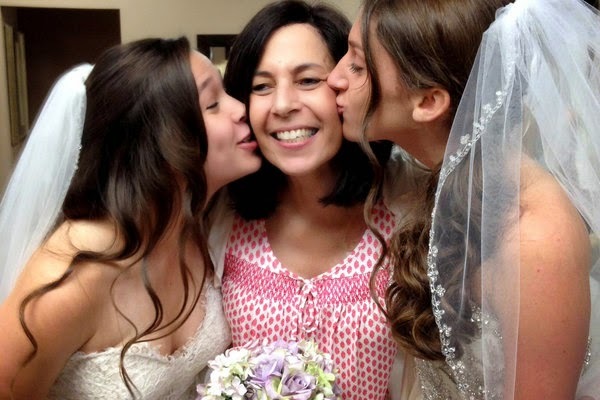 As we in the BRCA community often say, “knowledge is power,” and, indeed, knowing that I carry a BRCA gene mutation gave me the ability to make decisions to ensure that genetics wouldn’t dictate my destiny the way it did my mom's. That, Olivia, Madeline, Megan, Hilarie, Mary, and Betsy, is my wish for you. If you don’t already have it, may you gain the knowledge you need to make decisions that ensure that your genetics don’t dictate your destiny. May you live long and healthy lives, celebrate many, many Mother’s Days, and, perhaps most poignantly, may you shop for wedding gowns with your own daughters in the fullness of time. P.S. If you want to learn more about HBOC, check out the FORCE website, which includes a terrific, knowledgeable and supportive community of people affected by hereditary cancer. I hope you're not one of us, but if you are, we're here for you.